The Philippines: Central Visayas – Sometimes the wrong train will get you to the right place. We touched down in Cebu with a bit of time to spare before sundown. The airport was not a very happening place, and securing a SIM card took longer than we expected, so we wandered around outside waiting for a taxi for a few minutes before we found the stand. The ride into the city of Cebu itself took an hour in strangling traffic, even though the trip is only about 15km. Cebu is not a very nice-looking town, and really doesn’t have that much to offer. We were mostly using it as a base to get to other places, but we did manage to explore a bit of it near our hotel, in search of food and some last minute items for our upcoming adventure. 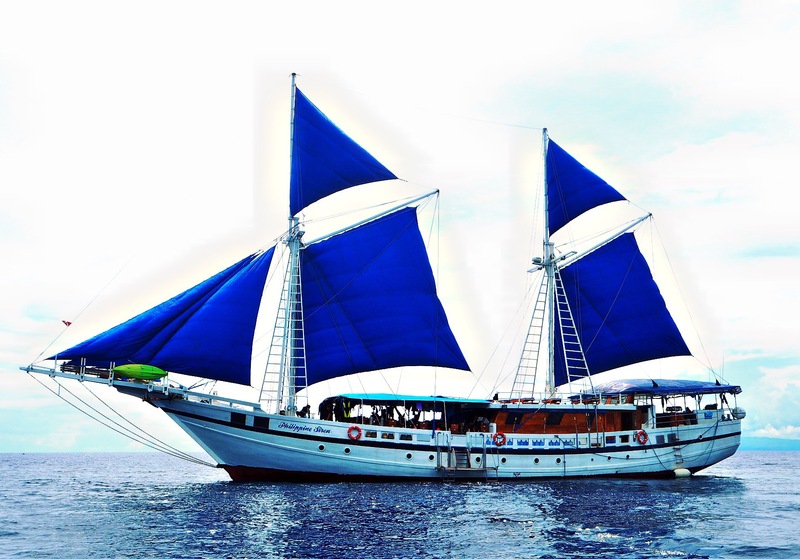 About a month ago we decided to splurge on a liveaboard dive boat in the Philippines and booked a trip. 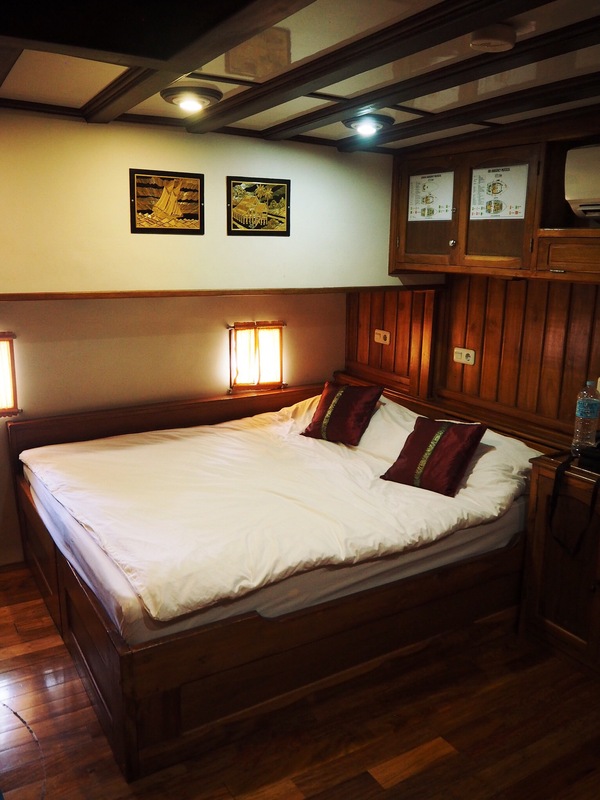 The first we had heard about the concept of liveaboards was in Indonesia, but we failed to take advantage of their availability there, and concluded that we would need to at some point. 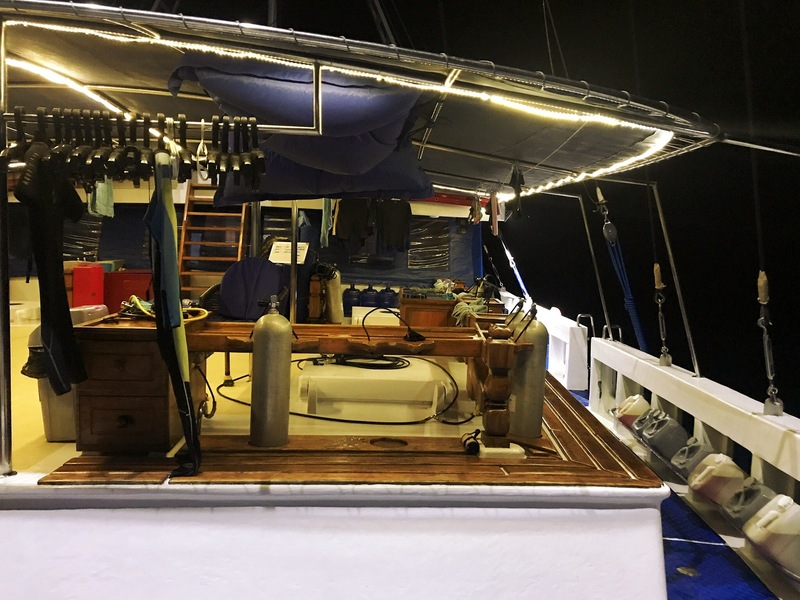 After all, spending some days on a boat in tropical waters diving every day doesn’t sound like a bad way to spend a bit of time. The downside is that they’re extremely expensive, not surprisingly, but we’d be damned if we were going to sit around missing out on amazing experiences for want of saving money. Our boat dispatched a van to come and pick us up from our hotel in Cebu to shuttle us over to the disembarkation port in Moalboal, on the opposite side of the island. The driver basically refused to shift, and spent a majority of the trip at least one gear lower than what is normal. The result was a very jerky ride, which left us with some sizable headaches. 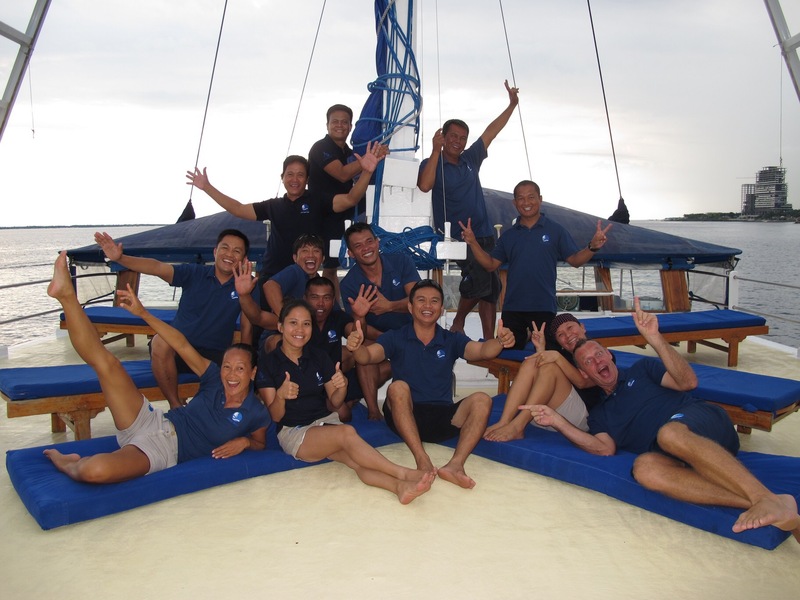 We eventually reached Moalboal, and were introduced to the boat, the crew, and our fellow divers, of which there were 10. Fortunately everybody was pretty cool, as we’d be trapped on a boat for the next week with them. Our first day aboard there was no diving, it was simply a matter of getting acquainted with the ship, the crew, and everything else we’d be calling home for the next week. Our cabin was lovely, a double bed in the corner with some port holes next to it just above the waterline, and an ensuite bathroom. The boat is massive, measuring 40 meters from stern to bow, and it’s technically a sailboat, although we’re told they only use the sails for photoshoots, as it apparently makes more sense to motor to the destinations it serves. Every meal is cooked on site by the full time kitchen team, and the local beer in the common fridge is unlimited and free (!). The following six days included a huge amount of diving. If we thought it would be a relaxing week, we were definitely wrong about that. 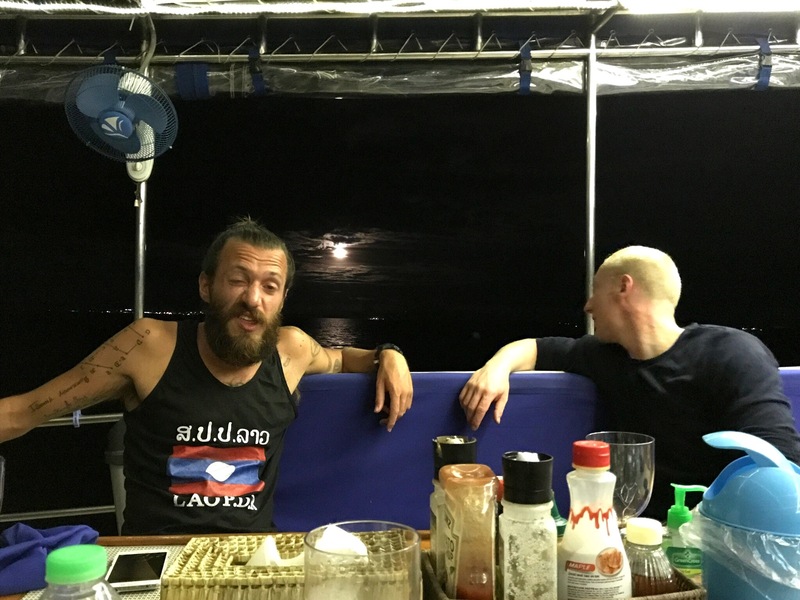 The daily routine was something like this: Wake up at 6:30am at the latest, have a light snack before heading back to the dive deck to get suited up for the first dive at 7:30am. Spend a little over an hour heading to the dive site by dinghy, diving, and heading back to the ship. Clean up, have a proper breakfast, and have 1.5 hours or so before the next dive briefing. Head out for the second dive at around 11am, followed by lunch at 12:30. The next briefing was at 2:30pm, so two hours to relax a bit. Head out for the third dive at 3pm, have a snack at 4:30pm, and then attend the night dive briefing at 6pm before heading out for the fourth and final dive of the day at 6:30pm. Have dinner at 8pm, and barely manage to keep your eyes open until 9:30pm, which we considered a very good time to go to sleep. All in all, there was just enough time to unwind a bit after each dive and before the next dive, and by the end of the day everybody was thoroughly exhausted. Joanry making some mango pancakes. 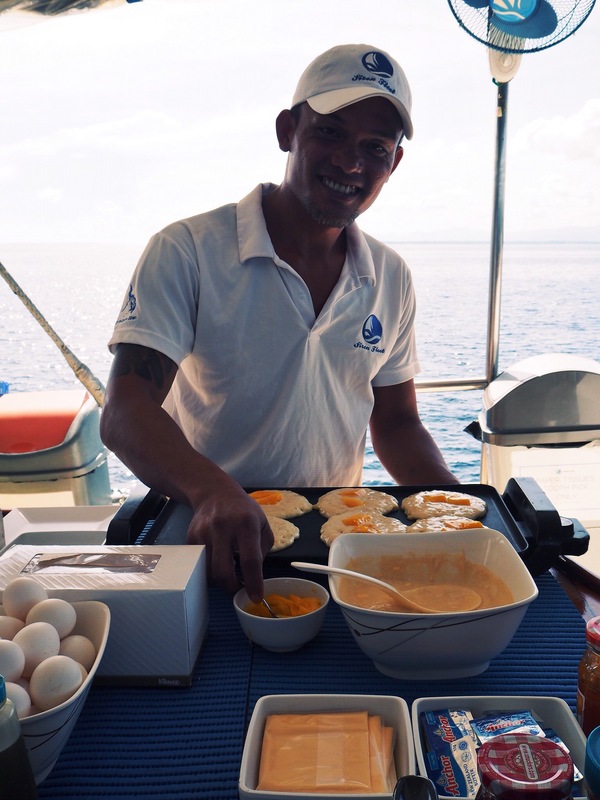 The crew was mostly fantastic, always serving up great meals to keep us well-fed and energized for our typical four dive days. Special shout outs go to Carmel, the boat’s hostess, who was always waiting with juice or water (or beer, if it was the last dive of the day) in hand before and after our dives; and to Boy, the boat’s bombastic chef, always dashing out of the galley with a bell to introduce the dishes. The more reserved Maureen and Joanry, the boat’s housekeeper and sous chef, respectively, drew much respect as well for their hard work and friendly attitudes. The more unsung heroes of the crew like Russell, the captain, and Marvin, one of the dinghy drivers, as well as many more, all worked very hard to make sure our experience was great. 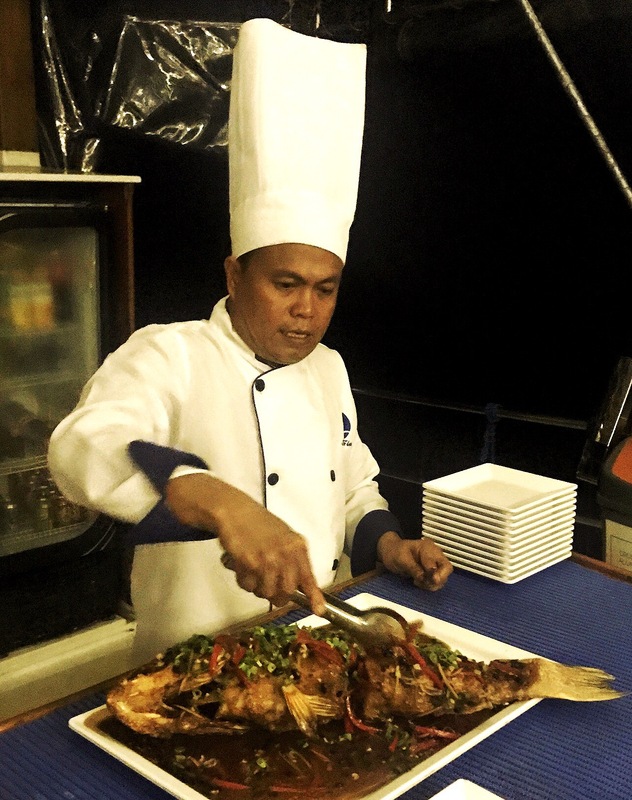 Boy putting the final touch on a whole grilled fish. Our crew posing in low visibility waters. There were 12 guests on board, but six of them were a group that mostly stuck together, socializing in a limited capacity outside their group. The other six were us, an older Italian couple, and an about-our-aged Swiss couple. We got on quite well with them, and forged a lasting friendship with the Swiss couple. Our Swiss buddies also took all the underwater photos from this post, as their submarine photography equipment was far better than ours, which is essentially non-existent. 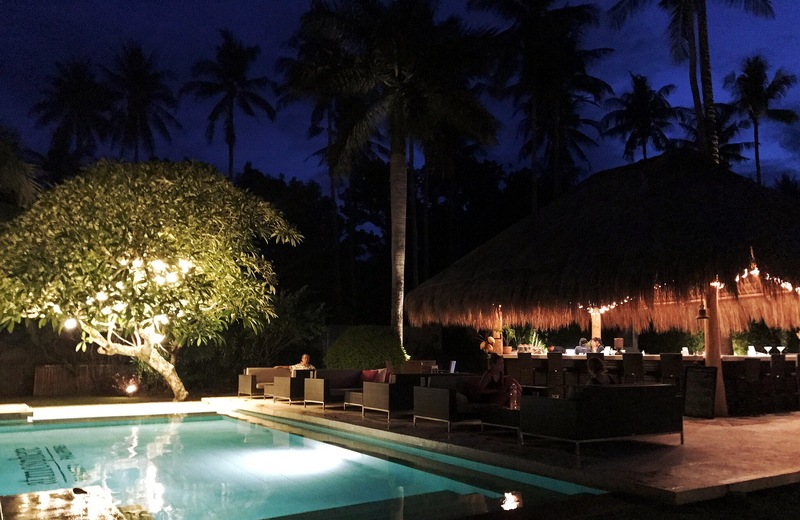 We had a one night break from night diving at the Atmosphere Resort on Negros Island. We dropped anchor not far from the resort, and the manager of the resort is close with the crew of our boat, so they invited us ashore for some happy hour drinks and a tour of the place. Atmosphere is really a sight to behold, with immaculately-maintained grounds, an on-site bakery and apparently a quite amazing restaurant, and a spa center. Most of the staff are hired from around the Philippines, but the owners of the place opened an international school on the property as well, mostly for their own children, but also to cater to any demand for that sort of thing in the area. Apparently these days there are several dozen students coming from all over the island. We had half a mind to just stay put as the place was so impressive, but ultimately we did say goodbye and get back onto our boat, as it wasn’t so bad there either. Oona enjoying a happy hour pineapple daiquiri. The poolside bar at Atmosphere. The dives were generally quite awesome. 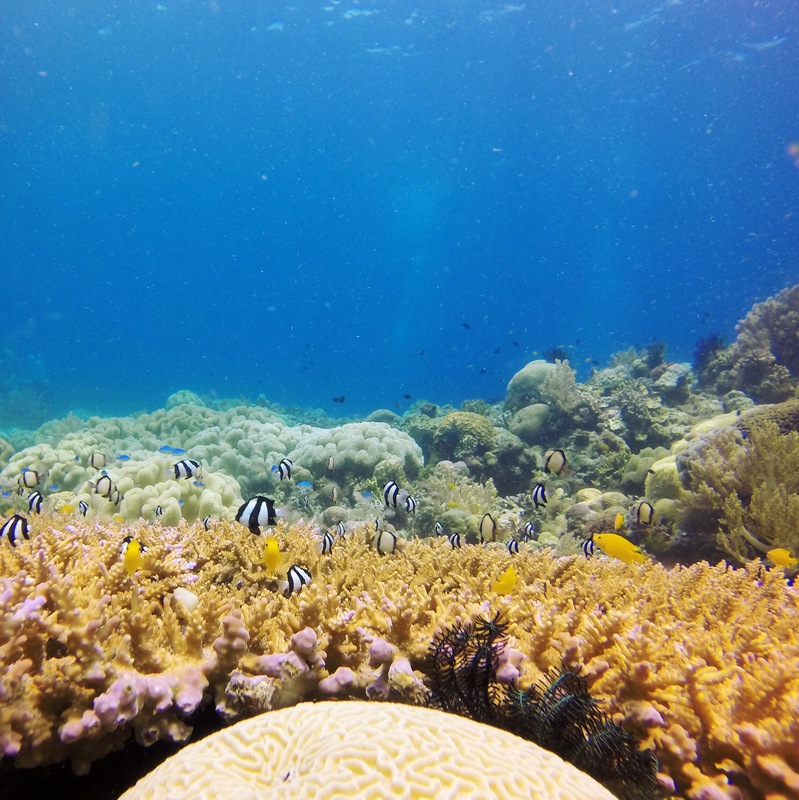 Some standouts were the sites around Apo Island, where we dove in some incredible underwater scenery, featuring dramatic walls falling off into the blue and amazingly colorful coral gardens. The Apo Island sites also had quite a few huge schools of Trevally that we swam through. A particularly memorable experience for Ian was his encounter with a tiny reef squid on our night dive at the Balicasag Mooring, just off Balicasag Island. The minuscule mollusc, no more than a few centimeters in length, floated in the beam of Ian’s flashlight, utterly transfixed by the light. It drifted closer and closer, unable to pry itself from the inevitable union with the glow. Eventually, some input of a tactile nature snapped our little friend from its trance, and it shot away in a flash, leaving a small splotch of ink as the only reminder of its episode with the orb. On the not-so-great side, Oona was viciously attacked by a territorial triggerfish. Just as her no deco time was nearing 0, she began a brief ascent to a slightly shallower depth. This apparently didn’t sit well with a nearby triggerfish which sped towards her from her blind side and lashed out with a series of jabs and stabs and attempts to take a bite out of her. Donato, the dive master, let out a shouted warning just as the triggerfish began to close in, but it was muffled to the point of unintelligibility through his regulator. The warning sounded a bit more dire than perhaps the situation was, so in a bit of a panic Oona turned to confront the attacking triggerfish. 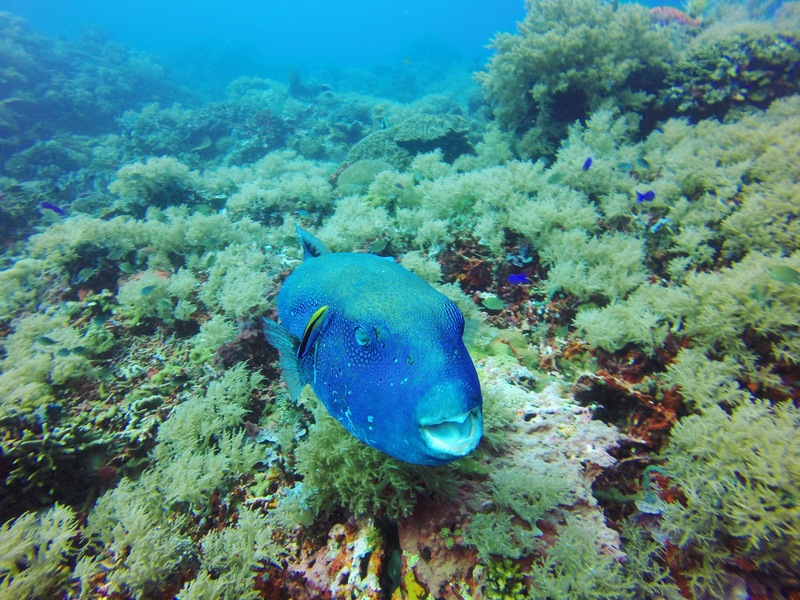 The onslaught was surprisingly sustained, however, and the triggerfish kept attacking over and over again. Eventually, after they had gotten out of its domain it receded to its lair. Shaken, but fortunately not injured, the crew returned to the surface. Coming back from a dive. 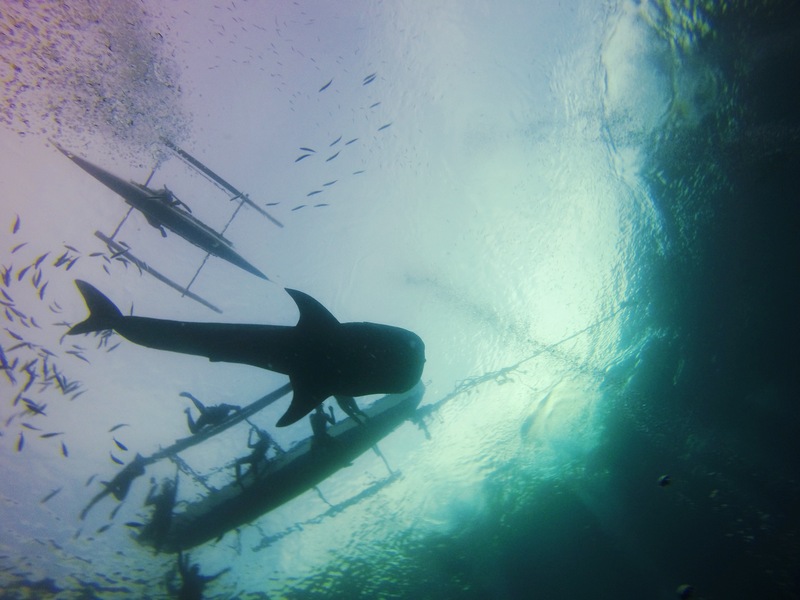 Another stop in the itinerary was at Oslob, which is famous for its whale sharks. 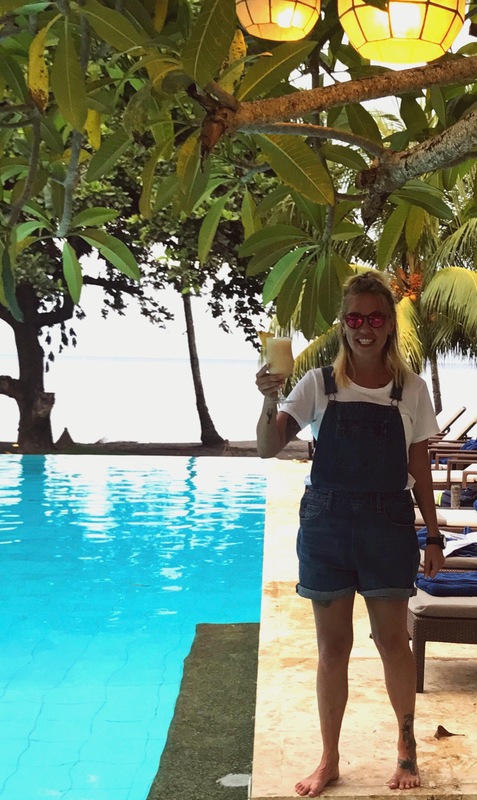 The attraction is quite commercial these days, with tour buses full of floundering snorkelers coming every day for a chance to see the majestic whale shark. They feed the beasts with bucketloads of shrimp and krill dumped from small boats on the water’s surface, and the whale sharks know to come here for a decent breakfast every morning. The gentle giants are quite impressive up close, and diving at the site is much better than hanging out on the surface with all the screaming snorkelers. Our wake up call that morning was particularly early, at 5:15am, to give us enough time to get suited up and drop in right at 6am, when the attraction opens. We had a precious few minutes at the start of the morning with only the whale sharks before the hordes of onlookers made it into the water, and there were many close encounters with these magnificent animals as they glided silently by on their way towards a filter full of krill. The route started from the harbor in Moalboal, and included stops for diving at Moalboal, Pescador Island on the west coast of Cebu Island, Dauin and Apo Island on the southeast coast of Negros Island, Oslob back on Cebu Island, Balicasag Island next to Bohol, and finally Cabilao Island even closer to Bohol. We headed back to Mactan just off Cebu City for the last night. All in all, the trip was very enjoyable, with an extreme amount of diving involved. 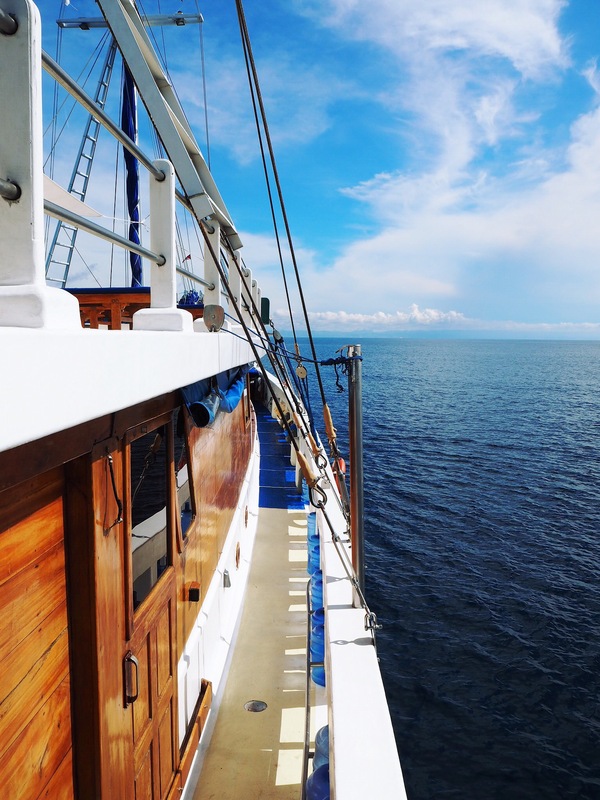 Life for a week on a boat is an interesting experience as well, as close quarters with basically everybody else on board –crew and passengers– is part of the daily routine. Fortunately the weather held up for the most part, with heavy rain only once or twice during the trip, and we always had our comfortable cabin to retire to in the event of that happening. The seas also remained calm, for which we were very thankful, as stormy seas could have sullied much of the trip. Derpin’ out in front of the moon. We spent our last full day on the boat mostly unwinding, with only two dives that day. The following morning we had our last breakfast, said farewell to the crew and fellow passengers, and headed off to the airport. Our flight was at almost 7pm, so we spent many hours at the airport. It went by mercifully quickly, and we boarded our plane westward to Palawan. Oona found some Finnish candies at the Cebu airport.